January 2010: A number of corrections have been made to the station data that are used to produce CRUTEM3 and HadCRUT3. 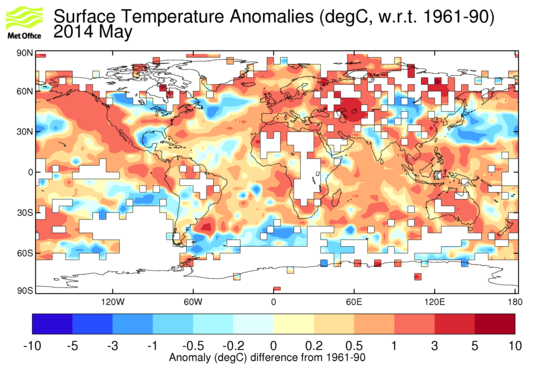 HadCRUT3 is a gridded dataset of global historical surface temperature anomalies. Data are available for each month since January 1850, on a 5 degree grid. The dataset is a collaborative product of the Met Office Hadley Centre and the Climatic Research Unit at the University of East Anglia. The gridded data are a blend of the CRUTEM3 land-surface air temperature dataset and the HadSST2 sea-surface temperature dataset. As well as a best-estimate valuue for the surface temperature, a comprehensive set of uncertainty estimates are available. The image below shows near surface temperature anomalies for the most recent available month. A plus sign in any grid box indicates that the temperature anomaly in that grid box this month is the highest since the dataset starts in January 1850. Similarly a minus sign signals the lowest anomaly since 1850. Various diagnostics are produced from the monthly gridded fields. These include images of monthly anomaly patterns, and global, regional and local time-series.